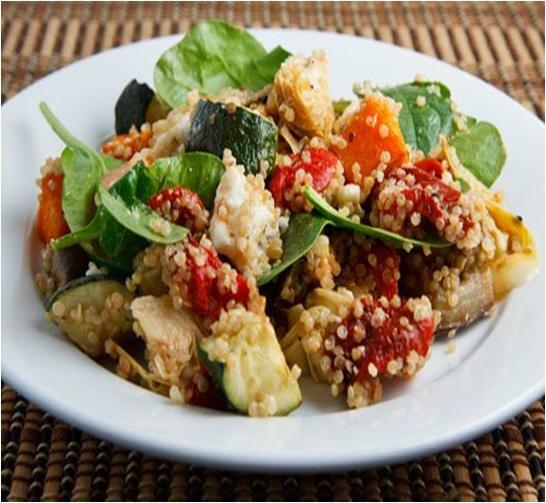 Roasted Vegetable Quinoa Salad is reasonably simple to prepare, making an exceptional starter for any meal. It can also suffice as a main dish and people would still love it! This amazing salad not only provides good quality taste but is a unique nutritious way to get in your every day vegetable portion. It is a packed full of roasted vegetables that you can prepare in advance and toss together with pre-chilled vegetables and quinoa right before dishing up. First of all, preheat your oven at 400 degree. Take a large mixing bowl and place eggplant, zucchini, and butternut squash in it. Add in olive oil and salt and pepper to taste. Toss all the ingredients for a few seconds until incorporated together thoroughly. Now, pour this mixture on to a baking sheet in a single layer and set the baking tray in your pre-heated oven. Bake it for approximately 25 to 30 minutes, turning over once in the middle. Remove it from the oven and set aside for some time until cooled enough to handle. Meanwhile, cook the quinoa according to the instructions given on the packet. Remove once cooked and rinse thoroughly. Set them aside. Grab a small mixing bowl and pour in olive oil, balsamic vinegar, oregano, and salt and pepper. Whisk them together for a few seconds until it forms a thick dressing. Place the roasted mixture in a large serving platter and add in the cooked quinoa. Pour in the dressing and toss the ingredients to coat them properly. Serve.